(from SicilianExperience.com) Collesano is a town in the Palermo province, standing on the slopes of Mount Grotta del Signore. It is surrounded by the fine Sicilian mountainous landscape with plenty of naturalistic riches. 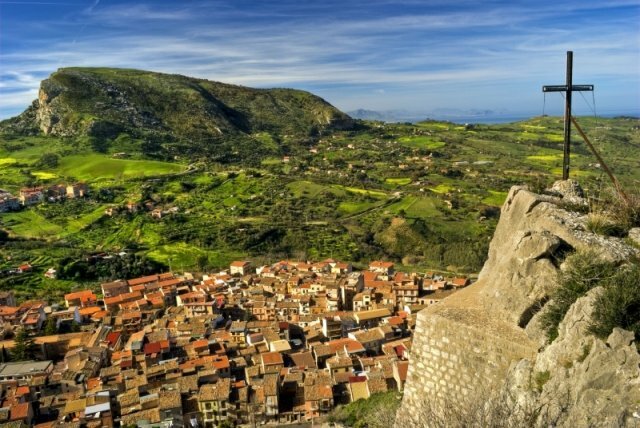 The town offers several cultural and historical sites as well, for those wanting to learn some Sicily facts which play such an important role in Italy's history. The castle, sitting atop a rocky spur, is a symbol of political and secular power, this particular Sicily property having long been the residence of Lords Ventimiglias. The Chiesa Madre dedicated to Santa Maria la Nova and San Pietro Apostolo is from 1400s. It is divided into three naves containing many works of art with paintings depicting the Conversion and Beheading of St. Paul, the Vocation and the Crucifixion of St. Peter; a 1400s panel dedicated to the Adoration of the Magi, and a Madonna dei Miracoli, being the city patron saint, celebrated on 26 May, the canvas is carried in procession to remember the miraculous intervention of the Virgin that eradicated a terrible plague in 1643. Several naturalistic sites in the city surroundings are worth-seeing, the town lying at a close distance from the central section of the Madonie mountain chain and from their Park. The road leading through Sicily's famous Madonie mountains is highly panoramic and runs past several naturalistic riches such as Piano Zucchi, an impressive park which is rich in wildlife, notably composed of fallow-deer and wild-boar. The road also leads to Piano Battaglia, a well-known area that derives its name from a battle between Arabs and Normans in 1069 and richest in naturalistic spots. These two sites are also major winter attractions most for ski and snow lovers. Monte d’Oro, the Abbazia di San Giorgio and the Casale Volpignano are just some of the many other sites that are worth an excursion or even a Sicily tour. Have you visited Collesano or do you live there? Any photos, thoughts, memories, etc. you would be willing to share would be greatly appreciated.